Nigel Reo-Coker has joined MK Dons on a short-term contract until the end of the season. The 33-year-old midfielder has been training with Dons for a month, making appearances for Edu Rubio's U23s side, and impressed manager Dan Micciche enough to offer him a contract until the end of the current campaign. 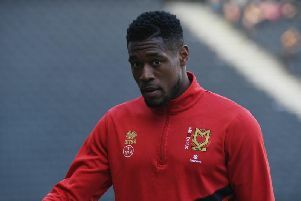 “I’m very happy to get the deal over the line," he told MKDons.com. "This a great opportunity for me and I’m thankful to Dan for giving me this opportunity. “I’ve enjoyed my time here so far. The atmosphere of the club makes it so easy to settle in and everyone has been great since I’ve been here – from the backroom staff to the supporters. There is a real family-friendly atmosphere which is what the original foundations of the cub is built on. Reo-Coker came through the ranks at Wimbledon and was part of the squad which moved to Milton Keynes in 2003. However, with the club in administration, Reo-Coker was sold to West Ham. After making 120 appearances for the Hammers, he spent time at Aston Villa, Bolton and Ipswich before taking his career overseas. However, after a short spell with Norwegian side Start, Reo-Coker was released at the start of the season and has been a free agent since. Micciche said: “I’m pleased to have Nigel signed until the end of the season. First and foremost, credit must go to Nigel because from day one here he has worked hard and has been a positive influence around the place. “We are light in the midfield having lost Alex Gilbey to injury so he provides us with another option there. He brings huge experience and great leadership qualities, which will be invaluable to us – we have some big games coming up and he has that experience of how to handle high-pressured situations.